Chao! 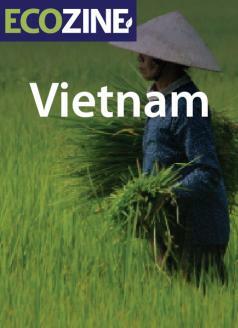 Welcome to the Eco Pages of Vietnam! Commonly referred to as “The Pearl of the Orient,” this beautiful jungle nation with remnants of French colonial culture has much to offer in the way of green lifestyle choices. Sandwiched between turquoise blue water and lush rice paddies, Vietnam has an abundance of natural resources which, when combined with the village's traditional way of life, offer visitors eco-friendly experiences they will never forget. In contrast to the crowds of motorcycles in urban areas, green fields dot the valleys along the Mekong Delta while the stunning beauty of limestone caverns and mountains attract trekkers to Vietnam’s Northern provinces. A number of Eco-Tours are easily found in the Eco-tours category if you need a guide. To relieve yourself from the heat, refreshing tossed papaya salads, rice paper spring rolls and noodles garnished with bean sprouts, basil, cilantro leaves and chili peppers are great options as noted by the eateries in the Restaurants category. As a quickly developing nation, Vietnam is also embracing green opportunities within the technology sector employing solar, wind, and geothermal energy production, and impressive waste management such as those listed in the Technology section.